In January 2005, NASA’s Opportunity rover found a nickle iron meteorite the size of a basketball lying near Endurance Crater and right next to the spacecraft’s heat shield. The meteorite received the name Heat Shield Rock. 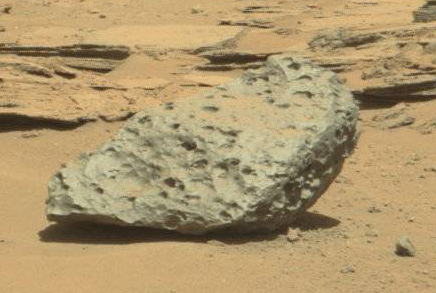 Image of Heat Shield Rock is in the public domain since it is from NASA. Four years later, during the summer of 2009, Opportunity found three nickle-iron meteorites on the Meridiani plain. The meteorites showed evidence of chemical alteration that suggested they landed when the Meridiani plain was was an acidic sea. Each of the meteorites was named after an island: Block Island, Shelter Island and Mackinac Island. The following year, 2010, Opportunity examined the large iron meteorite Oilean Ruaidh. 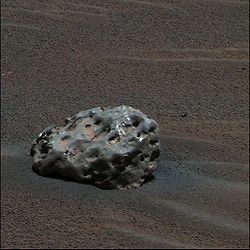 In 2006, on the other side of Mars, Spirit found two metallic (reflective), smooth rocks next to each other on the Columbia hills of Gusev crater. They were named Allan Hills and Zhong Shan. In May of 2014, the Mars Science Lab (Curiosity) drove past two huge meteorites. This one, called Lebanon, is about two meters long with a smaller fragment imbedded in sand in the foreground. A few meters away Curiosity photographed another large metallic meteorite named Littleton. Since it was about 30 meters from the rover’s camera, it seems to be about half a meter wide. Images are from NASA / JPL / MSSS and Thomas Appere. The meteorites found by Opportunity, Spirit and Curiosity are thousands of kilometers apart. Since the rovers drove less than 50 kilometers and detect this many iron meteorites lying on the surface, evidently millions of nickle iron globs rained down on Mars. When you discover a nickle iron meteorite, you are looking at a part of a former planet’s molten core. Four times the Bible mentions Rahab (the mighty) that was shattered. It uses the imagery of a sea serpent to describe this event, like the Canaanites used for the break up of one of their planet gods. If a great watery planet was shattered close to Earth, each piece would likely be followed by a vapor tail. This could have looked like a multi-headed sea serpent to the seafaring Canaanites, as they described. Is there other evidence that a planet was shattered in the solar system? Thousands of asteroids circle the Sun in the same direction between Mars and Jupiter. Some rocks from asteroids and comets formed in liquid water, such as cubanite. Other rocks contain crystals that on earth formed deep underground under volcanic conditions. Asteroids have strange shapes like peanuts or dumbbells. They seem to be solid, made of rock with dust avalanches running down in the valleys. Many asteroids have moons. There is no way to explain a capture of a moon by an asteroid unless both pieces were adjacent to each other and flew off together after the breakup. Why did all ancient societies tell stories about the crushing of a planet? Why does the Bible mention a close passage twice and the crushing event – four times? Evidently planets did pass close to earth a few thousand years ago and one of them was shattered. Why did planet pass closely a few thousand years ago, but now they are far away? Perhaps it was the same thing that caused star streams in billions of galaxies to spiral out as they grew into huge, growth spirals. Ancient atomic clocks ticked at tiny fractions of the frequencies of modern atoms. Even local atomic clocks, when compared to their reflections from hours ago (Pioneer anomaly) blueshift in the same manner as the atoms in hundreds of billions of galaxies. (The fastest atomic clocks are local). A few thousand years, Homer said the sky was bronze and the ocean wine colored. The Egyptians painted the Sun red, not white. The ancient poets never said the sky was blue, but modern poets do. Evidently atoms have been changing their properties relationally (that is in parallel) locally and throughout the visible continuum of cosmic history. What is gravity? Visible cosmic history suggests that it is what emerges from matter as it continues to change its properties relationally. In relational changes, no properties remains the same; they all change together in parallel. Whatever gravity may be, we detect that its effects propagate at light speed with several experiments. Gravity’s aberrations causes the Sun to pull more on Earth’s leading hemisphere than its trailing side. This accelerates our orbit and rotation (days and years) together. This steady torque also cause large moons, planets and exoplanets to have logarithmically spaced orbits. The visible continuum of comic history only fits the Hebrew creation account, not the myths scientists weave about a universe that is 99% invisible. Please read the seven days of creation on this web site.